Nintendo would like to take a few minutes to remind everyone that Super Mario 3D World is out now in the United States, and will drop November the 29th in Europe, with a brand new launch trailer. Here you can see all of the possible expressions and emotions a human being can experience while playing a co-op Mario game. Beware of all of the gratuitous power-up action, too. This video does a great job at giving you the breakdown pf the playable characters for those who never played Super Mario Bros 2 (for which you should be ashamed). Our good friend and the world's most prolific video game character, Mario, is the best all around. His lanky brother happens to be really great on the high-jump team. Series minion Toad can haul faster than anybody. Lastly, Princess Peach can straight up float, and what's not to like about floating? 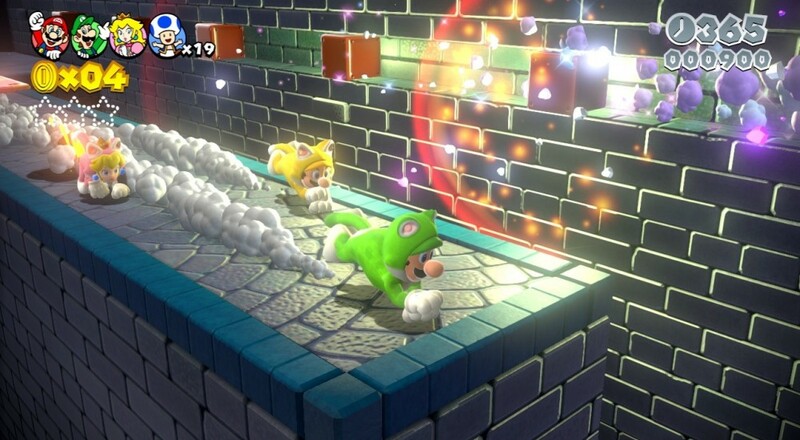 The trailer also shows some of the spiffy power ups you'll encounter along the way. The cat suit makes an appearance on the box itself, but there are plenty more special items to beef up your team. How about an item that makes a second character appear? Or maybe you'd like to turn the tide and make the piranha plants work for you? The levels and abilities offer tons of variety for you and your co-op cohorts to sink your claws into. Page created in 0.3949 seconds.